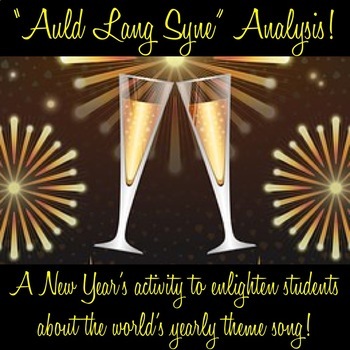 New Year's Poetry Analysis Activity with "Auld Lang Syne!" 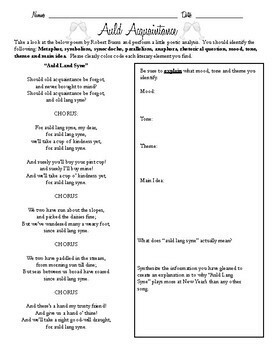 “Auld Lang Syne” is a fun poem/song of nostalgia that has way more going on than any New Year’s reveler gives it credit for! With this lesson plan students will get up close and personal with the poem and be able to enlighten their friends and family members with a detailed analysis of the text where they identify parallelism, symbolism, metaphor, anaphora, rhetorical question, synecdoche, mood, tone, main idea and theme! 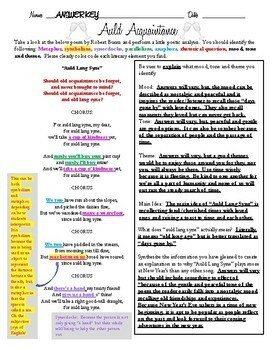 This lesson plan INCLUDES AN ANSWER KEY FOR THE ANALYSIS AND A RUBRIC FOR THE POEM ACTIVITY! When students are done with the initial analysis they then listen a differing version of “Auld Lang Syne” (they are given three versions to choose from!) and compare how well the song they listened to matches the mood/tone/theme of the original intent of Robert Burns’ poem! Lastly, students are given the opportunity reflect on their own lives over the past year and create a New Year’s poem that is relevant to them! All images in this file were gratefully gathered from Pixabay. Thank you for checking out my lesson plan! Happy teaching! Keywords: New Year’s activity, secondary, New Year’s Eve, Auld Lang Syne, Robert Burns, old lang syne, days gone by, high school, middle school, analysis, close read, parallelism, metaphor, synecdoche, rhetorical question, anaphora, symbolism, mood, tone, theme, main idea, poetry, creative writing, New Year’s Day, new year, reflection, poem.